Wednesday, May 10th, fifth grade Waldorf students from the Madison Waldorf School, City of Lakes Waldorf School, Minnesota Waldorf School, and for the first time, Duluth’s Spirit of the Lake Waldorf School will join Pleasant Ridge Waldorf School (PRWS) at Sugar Creek Bible Camp for the official opening of the annual Pentathlon. 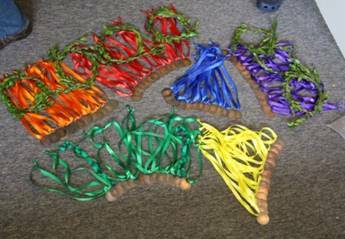 These games have a long tradition in Waldorf Schools throughout the world as they arise out of the fifth grade curriculum where the students engage in the study of Greece and Rome. 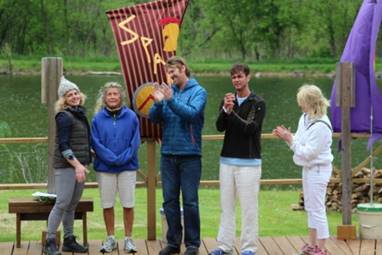 From early on in their experience at Waldorf Schools children hear about the Fifth Grade Pentathlon, so it is a much anticipated event. Our games teacher, Miss Lerie, has been working with Christina Hotchkiss’ fifth grade class. They have been practicing all year for the five events they will compete in: long-jump, sprinting, discus, javelin, and Greek wrestling. Wednesday afternoon, before the games, the fifth grade students sing Glorious Apollo in the school and then dash down the hall and head off for the games with the entire PRWS student body wishing them good luck. The students from all five schools (nearly 62) are divided into six “City States”: Olympia, Athens, Sparta, Thebes, Corinth, and Ithaca. They participate in events, eat, and share cabins in these groups. 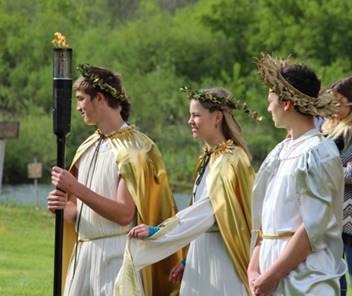 On May 11th, three Greek gods, Zeus, Athena and Apollo, open the games, and the Pentathlon flame is held high. The City State teams, led by their leaders, will begin their first contest and move through each of the five events. Witnesses for the events will score each of the students’ efforts according to three categories: Truth, Beauty, and Goodness, selecting finalists from each City State to exhibit their skill in one of the five featured events. Each athlete receives a medal to honor their participation and training. Parents from our fifth grade provide excellent support to the games from coordinating with other schools and the site to setting up the fields of engagement and serving as overnight chaperones, as well as many other details. Thursday evening, our P RWS sixth grade students (last year’s Pentathletes) along with their parents prepare a Greek Feast for all the students, their parents, and their teachers to celebrate their accomplishments. This is a wonderful celebration for our students and of the rich curriculum that is offered at a Waldorf School. 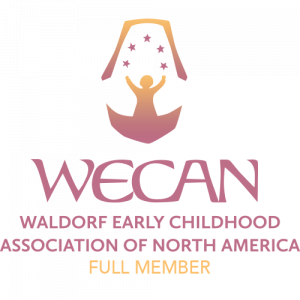 100 Years of Waldorf Education – Learning to Change the World!